IRANIAN TARD IN THAILAND PREMATURELY BLOWS HIS PANTS OFF ON VALENTINES DAY……. – The Tundra Tabloids……. 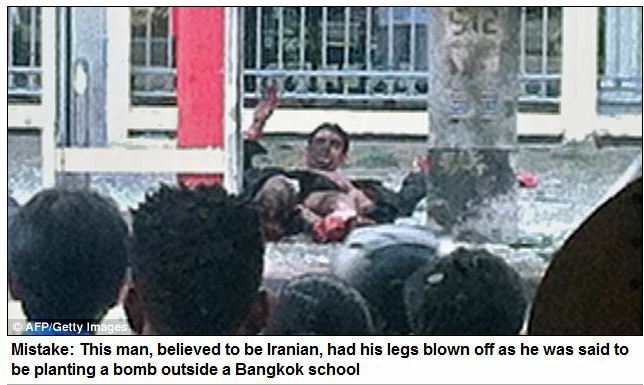 IRANIAN TARD IN THAILAND PREMATURELY BLOWS HIS PANTS OFF ON VALENTINES DAY……. Luckily he offed himself before he had a chance to murder some people. Very possible that it is in connection with yesterday’s attack on Israeli embassies. UPDATE: He threw a hand grenade at the police and it bounced off a tree back at him and blew his own legs off. One good note, he didn’t die, so the police can interrogate him and it was easier to catch him without his feet. More here. Previous Post Previous Post ABU QATADA FREED FROM JAIL: TERRORIST WALKS THE STREETS OF UK……. Next Post Next Post UGANDAN PASTOR GETS ACID IN FACE FOR BEING AN APOSTATE FROM ISLAM, ISRAEL TREATS HIS BURNS…….